With the legalization of recreational marijuana in October 2018 in Canada, it is important to understand the impact of marijuana use on your overall health, including the health of your eyes and on the quality of your vision. It is important to first understand the composition of marijuana and how it impacts your body. There are two main components to marijuana; CBD and THC. Cannabidiol (CBD) is a naturally occurring component of cannabis that has no psychoactive component (it will not make you feel “stoned”) while Tetrahydrocannabinol (THC) is the component of cannabis that is responsible for marijuana’s psychological effects. When a user is purchasing marijuana, there are a variety of strains available with varying ratios of CBD and THC. The THC found in marijuana is the component that is responsible for lowering blood pressure which dilates blood vessels and causes an increase of blood flow throughout the body. This causes blood vessels in the eyes to expand which causes redness or bloodshot eyes after smoking marijuana which is perhaps the most common and immediate visual response to the drug. 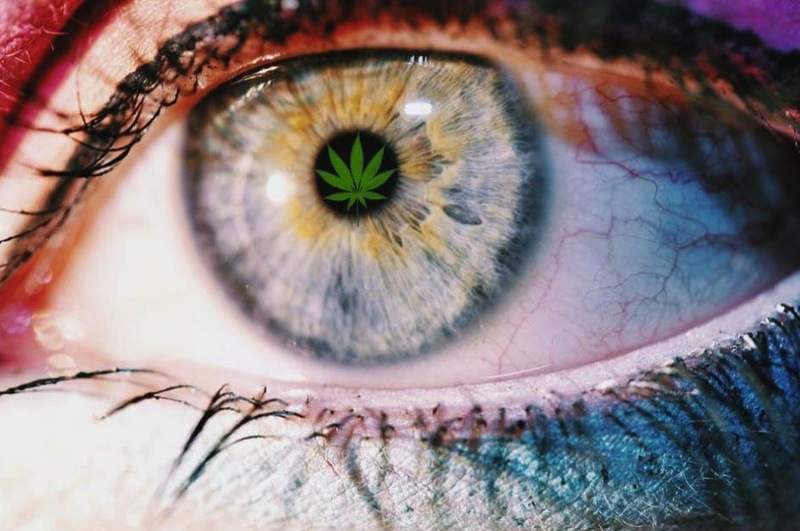 Other notable changes to vision immediately after cannabis consumption can include a delay in transmission of information from the retina to the brain and it has been noted that some users experience altered vision, particularly when using a THC-rich strain of marijuana. Medicinal marijuana has been historically prescribed for the treatment of symptoms for a number of ocular diseases including glaucoma, degenerative blindness and diabetic retinopathy. Those strains that are CBD-rich are favourable for patients looking for relief from inflammation, pain and other symptoms. Glaucoma is the leading cause of blindness worldwide and is caused by an increase in the intraocular pressure in the eye. As the pressure increases, the risk of damage to the optic nerve also increases and can lead to loss of central vision. Marijuana is known to decrease intraocular pressure albeit for a short period of time. While marijuana can help to support symptoms of glaucoma, it is not recommended as a sole treatment for the disease. Preliminary studies suggest that the use of marijuana may help to slow progression of blindness in patients living with degenerative blindness, specifically retinitis pigmentosa (also known as tunnel vision). Further studies are currently being completed. Diabetic retinopathy is an eye condition that is prevalent in those living with types 1 and 2 diabetes and is caused by damage to blood vessels in the retina. Diabetic retinopathy develops when high levels of blood glucose being to cause damage. Cannabis is neuroprotective and a known anti-inflammatory and has therefore been used to protect the retina from damage caused by diabetic retinopathy. It has been established by healthcare professionals that the chronic use of marijuana can have negative effects on the lungs when smoked and can have detrimental effects on brain function and memory retention but what is yet to be noted is the effect that long term cannabis use has on your vision and overall ocular health. Early research shows that marijuana may have a positive effect on night vision. The results showed that retinal ganglion cells, which are the neurons in the inner eye, become more sensitive to light after being exposed to cannabis. This allows for better ability to distinguish contrast after that exposure. Much research is still being completed to examine potential impacts of marijuana on peripheral vision, changing eye pressure, and visual processing. Using marijuana may have potentially serious impacts on these areas. Perhaps the largest challenge with these studies is the other factors such as tobacco use, alcohol use, diet and lifestyle that also affect retinal function.